New research shows that elk herds infected with chronic wasting disease (CWD) for decades are genetically different than herds that haven’t been exposed to the fatal disease. It all comes down to a specific gene and a relatively rare variant of a protein. Elk herds with a long history of CWD have the rare version of the protein at twice the frequency when compared to herds that do not have CWD. This protein is important because previous studies on elk in captivity found that elk with the rare version of the protein can survive longer after contracting CWD, which may also allow them more time to reproduce. Elk with the more common version of this prion protein may only live two years or less before succumbing to the disease. How this single, genetic difference might affect other aspects of health and fitness in herds remains to be seen. For example, carrying this rare version of the protein may have other unknown harmful effects on elk, and other factors, such as new strains of CWD, may also affect the influence of the rare protein on elk herds with CWD. It is important to note, too, that most elk studied do not have the rare variant of the protein. This suggests that wildlife managers should continue to take a cautious approach and adopt strategies that minimize the spread of CWD. “One of the most important conclusions from this study is that we cannot assume this genetic adaptation will prevent the impacts of CWD on elk. 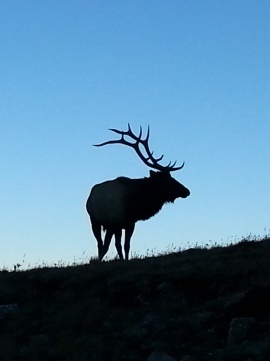 We must continue to evaluate and, where necessary, adjust how we manage elk populations that are or could be exposed to this disease,” says Dr. Ryan Monello, lead author of the paper Pathogen-mediated selection in free-ranging elk populations infected by chronic wasting disease. To see if wild herds are adapting to CWD, biologists from the National Park Service, Wyoming Game and Fish Department, USDA Agricultural Research Service, and Washington State University collected and analyzed more than 1,000 samples from elk populations in Colorado, North Dakota, and Wyoming. Some of the herds had been infected with CWD for 30-50 years, while others had never been exposed to CWD. “CWD remains a major concern for the health of wild deer and elk populations and now occurs in more than 20 states and provinces in North America. These findings are critical for establishing a baseline in our study populations and understanding how elk populations may or may not be able to respond to CWD going forward,” Dr. Monello says. This research was published online by the Proceedings of the National Academy of Sciences on Oct. 30, 2017. Read the full paper here. The 2017 elk reduction program begins Saturday, October 28 in Grand Teton National Park. The areas of the park open to the program, Elk Reduction Areas 75 and 79, are mostly located east of U.S. Highway 89. Area 79, the more northerly section, closes October 31. The Antelope Flats portion of area 75 closes November 30, and the remaining portions of area 75 close December 10. These areas remain open to park visitors, and the wearing of orange or other bright colors is highly recommended during this time. The park’s enabling legislation of 1950 authorizes Grand Teton National Park to jointly administer an elk reduction program with the Wyoming Game and Fish Department when deemed necessary for the proper management and conservation of the Jackson Elk Herd. Respective federal and state managers and biologists have reviewed available data and concluded that the 2017 program is necessary. A total of 600 permits are authorized for the 2017 program, the fewest of any year the program has been in effect. The need for this reduction program stems partly from a management framework that includes annual winter feeding programs on the National Elk Refuge and in the upper Gros Ventre River drainage. Feeding sustains high numbers of elk with unnaturally low mortality rates. A majority of elk that are fed during the winter spend summers in Grand Teton National Park or use migration routes across park lands. The reduction program targets elk from three primary herd segments: Grand Teton, southern Yellowstone National Park, and the Teton Wilderness area of Bridger-Teton National Forest. Participants in the program must carry their state hunting license, conservation stamp and permits, use non-lead ammunition, and are limited in the number of cartridges they are able to carry each day. The use of archery, hand guns, or other non-center fire ammunition rifles is not permitted, nor is the use of artificial elk calls. In addition, participants, regardless of age, are required to carry a hunter safety card, wear fluorescent orange and carry and have immediately accessible non-expired bear spray. Information packets accompanying each permit warn participants of the risk of bear encounters and offer tips on how to minimize the risk of human-bear conflicts. Park rangers and biologists will monitor and patrol elk reduction program areas to ensure compliance with rules and regulations, interpret the elk reduction program to visitors, and provide participants with outreach regarding bear activity and safety. 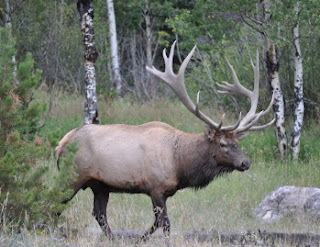 An information line for the elk reduction program is available at 307.739.3681. As part of its commitment to improve the visitor experience and ensure America’s national parks are protected in perpetuity, the National Park Service (NPS) is considering increases to fees at highly visited national parks during peak visitor seasons. Proposed peak season entrance fees and revised fees for road-based commercial tours would generate badly needed revenue for improvements to the aging infrastructure of national parks. This includes roads, bridges, campgrounds, waterlines, bathrooms, and other visitor services. 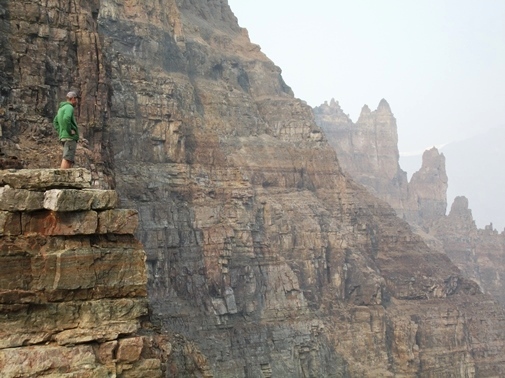 Under the proposal, peak-season entrance fees would be established at 17 national parks. The peak season for each park would be defined as its busiest contiguous five-month period of visitation. The proposed new fee structure would be implemented at Arches, Bryce Canyon, Canyonlands, Denali, Glacier, Grand Canyon, Grand Teton, Olympic, Sequoia & Kings Canyon, Yellowstone, Yosemite, and Zion National Parks with peak season starting on May 1, 2018; in Acadia, Mount Rainier, Rocky Mountain, and Shenandoah National Parks with peak season starting on June 1, 2018; and in Joshua Tree National Park as soon as practicable in 2018. A public comment period on the peak-season entrance fee proposal will be open from October 24, 2017 to November 23, 2017, on the NPS Planning, Environment and Public Comment (PEPC) website https://parkplanning.nps.gov/proposedpeakseasonfeerates. Written comments can be sent to 1849 C Street, NW, Mail Stop: 2346 Washington, DC 20240. If implemented, estimates suggest that the peak-season price structure could increase national park revenue by $70 million per year. That is a 34 percent increase over the $200 million collected in Fiscal Year 2016. Under the Federal Lands Recreation Enhancement Act, 80% of an entrance fee remains in the park where it is collected. 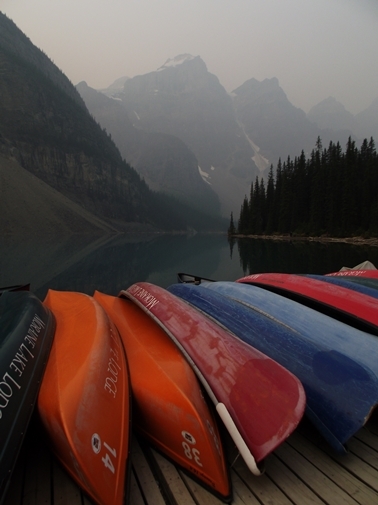 The other 20% is spent on projects in other national parks. During the peak season at each park, the entrance fee would be $70 per private, non-commercial vehicle, $50 per motorcycle, and $30 per person on bike or foot. A park-specific annual pass for any of the 17 parks would be available for $75. The National Park Service is also proposing entry and permit fee adjustments for commercial tour operators. The proposal would increase entry fees for commercial operators and standardize commercial use authorization (CUA) requirements for road-based commercial tours, including application and management fees. All CUA fees stay within the collecting park and would fund rehabilitation projects for buildings, facilities, parking lots, roads, and wayside exhibits that would enhance the visitor experience. The fees will also cover the administrative costs of receiving, reviewing, and processing CUA applications and required reports. In addition, the proposal would include a peak-season commercial entry fee structure for the 17 national parks referenced above. All proposed fee adjustments for commercial operators would go into effect following an 18-month implementation window. Information and a forum for public comments regarding commercial permit requirements and fees is available October 24, 2017 to November 23, 2017 on the NPS Planning, Environment and Public Comment (PEPC) website at http://parkplanning.nps.gov/commercialtourrequirements. Written comments can be sent to National Park Service, Recreation Fee Program, 1849 C Street, NW, Mail Stop: 2346 Washington, DC 20240. Going-to- the-Sun Road will reopen to Avalanche from the West Entrance by 12 pm on October 21. Going-to-the-Sun Road access from the St. Mary entrance is currently to Rising Sun. 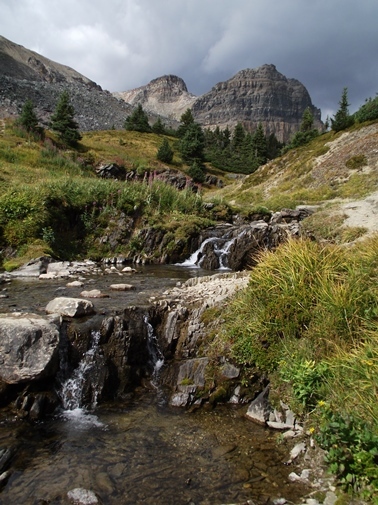 Logan Pass vehicle access from both the east and west park entrances has ended for the season. The Going-to- the-Sun Road had previously been closed at Apgar on the west side of the park due to Sprague Fire activity, and then due to a large culvert replacement project several miles up the lake. A significant amount of construction will still be occurring simultaneously with this road opening, some of which was delayed during the Sprague Fire and now must occur before winter. Visitors can expect intermittent one-lane traffic and delays between Apgar and Avalanche. Pullout rehabilitation continues, and many pullouts are closed as a result. A portion of the Trail of the Cedars boardwalk has been removed to allow equipment access to the pedestrian footbridge currently under construction. The bridge is being modified to fully comply with ABA/ADA standards. Walking the Trail of the Cedars loop is not currently possible. In addition, a tree has fallen across the boardwalk portion breaking it, so the boardwalk portion of the trail is also temporarily closed. Visitors should obey signs and not enter construction zones. Avalanche Lake Trail will be open, though hikers can expect to see trail crew conducting routine maintenance activities. In addition, a wind storm from earlier in the week has knocked down approximately 140 trees across the trail. The trail may close intermittently for tree clearing activities. 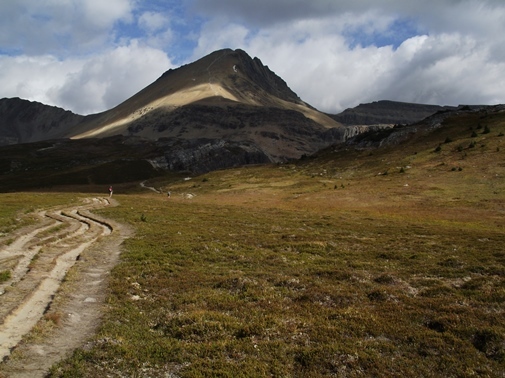 Hikers should expect a much more difficult hiking experience than is typical due to trail condition. Trails within the Sprague Fire burn area remain closed, including the trail to Sperry Chalet. The park estimates that nearly 2,000 trees have fallen over trail systems within the burn area. Hundreds more are expected to fall this winter with heavy snow. Significant tree fall hazards currently exist. The area closure is to protect human life and safety and violations carry federal penalties. Trail crews will assess and begin clearing trails within the burn area in the spring when the threat to human safety is lower. In the coming weeks, previously scheduled construction work on the entrance road to Avalanche Campground will begin. This will involve significant road excavation. Parking access in the campground once this construction begins will not be possible, even on weekends, due to the level of excavation that will occur. Visitors to the Avalanche area should park in the picnic area once campground road construction is underway. A waterline will be installed between Sprague Creek Campground and Lake McDonald Lodge along the side of the Going-to- the-Sun Road. Traffic delays will occur around this operation as one lane will be utilized for construction. The Lake McDonald Lodge parking area and pedestrian areas around the lodge will be closed for a period of time while the park completes flood risk mitigation activities following the Sprague Fire. Those activities include cleaning out culverts, pedestrian bridge modifications, and installing creek bank reinforcements in the Sprague and Snyder drainages. Late-season hiker and biker access is currently to The Loop on the west side (beginning October 21) and Jackson Glacier Overlook on the east side. The full road is not available to hikers and bikers right now because of excessive rock fall and treefall following this week’s wind storm. Hiker and biker access changes regularly in the late fall, and will shift to ski access as winter progresses. Hikers, bikers, and vehicles may see more wildlife right now because the Avalanche area has been closed to the public in recent weeks. Bears are especially active at this time of year as they enter hyperphagia, a period when they seek large amounts of food before they den for the winter. All park visitors should carry bear spray in a readily accessible location, should know how to use it, and should remember required safe wildlife viewing distances. Those distances are 300 feet for bears and wolves, and 75 feet for all other wildlife. Due to the scope of construction activities in the road corridor, delays experienced due to the Sprague Fire, and approaching winter, it is possible that the Going-to- the-Sun Road could re-close at one of the lower gates (Apgar, Lake McDonald Lodge, North McDonald Road, etc.) to facilitate more rapid construction. Typically the road closes at Lake McDonald Lodge on the west side on or before December 15, weather dependent. Visitors entering the Going-to- the-Sun Road corridor through the West Glacier entrance should be mindful that the Sprague Fire continues to smolder to the east of the road, and is relatively close to the road in some areas. The entire fire area remains closed, and threats to human life and safety exist. Visitors should remain in the road corridor or on open trails and abide by area closures at all times. 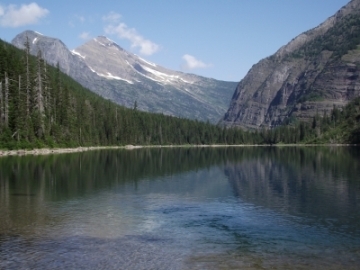 The National Park Service would complete the appropriate environmental compliance work and oversee the project in partnership with the Montana Conservation Corps. Project information can be viewed and written comments submitted using the Planning, Environment and Public Comment (PEPC) system, hand-delivered, or mailed to the address below. Comments will not be accepted by fax, e-mail, or in any other way than those specified above. Comments must be received by midnight MST, November 18, 2017. •Bulk comments in any format (hard copy or electronic) submitted on behalf of others will not be accepted. •Before including your address, phone number, email address, or other personally identifiable information, be aware that your entire comment – including your personally identifiable information – may be made public at any time. You may ask us to withhold your personally identifiable information from public review, but we cannot guarantee that we will be able to do so. •The proposed project is an undertaking as outlined under Section 106 of the National Historic Preservation Act (NHPA) (36 CRF § 800). As such, we welcome comments about historic properties or other cultural resources that fall within the project area. The public is invited to talk with the Wyoming Game and Fish Department about what they would like to know and learn about grizzly bears. Game and Fish will be holding community meetings statewide beginning in mid-November where all people with an interest in grizzly bears can talk with wildlife managers. In May of last year the Wyoming Game and Fish Commission approved a new version of its grizzly bear management plan. Now that the species has been delisted, management in Wyoming will be guided by this plan. These meetings will be an opportunity for those who are interested to weigh in on all components of grizzly bear management. “We are excited to have conversations with the public and hear what they want to know and learn about their grizzly bears. We want these gatherings to be productive information sharing and listening sessions about an iconic animal that most everyone in Wyoming and beyond is interested in,” said Dan Thompson, Game and Fish large carnivore section supervisor. The meetings will be a chance for the public to learn more about all aspects of grizzly bear research, education and management in Wyoming and help shape grizzly bear conservation in the future. Game and Fish biologists will open each meeting with a brief informative presentation on grizzly bear recovery and conservation, an overview of the major components of the grizzly bear management plan and what Game and Fish hopes to gain from discussions with the public. Thompson said that while much outside focus and interest has been solely on hunting, the goals of the meeting are to talk about the overall grizzly bear management and the education and outreach program, Bear Wise, within the Game and Fish. Specific times and locations will be announced at the end of October. 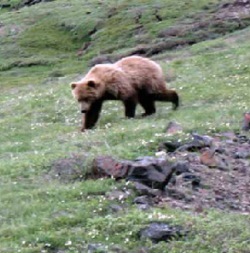 Information about grizzly bear management and education efforts is available on the Game and Fish website. To accommodate road maintenance, a brief travel closure will be in place on Tuesday, October 17 on the unpaved section of the Moose-Wilson Road in Grand Teton National Park. The section of road will be closed beginning at 7:00 a.m. and will reopen by 5:30 p.m. The road will be graded and rolled to improve conditions which have deteriorated recently due to wet weather. Motorists and bicyclists should plan to use an alternate route on October 17 as this temporary closure will prevent making a ‘through trip’ on the Moose-Wilson Road between the Granite Canyon Entrance Station and the Teton Park Road at Moose, Wyoming. For those wishing to reach the Laurance S. Rockefeller Preserve or the Death Canyon Trailhead, access will be possible by heading south from the Teton Park Road junction near the Craig Thomas Discovery and Visitor Center. Electronic signs will be placed on Wyoming Highway 390 to alert park visitors and local residents of the scheduled road closure. For travelers heading south to Teton Village from the Moose area, signs will also be placed near the junction of the Teton Park Road. Roadwork schedules may change, or be delayed, due to weather conditions, equipment malfunction, or other extenuating circumstances. The Moose-Wilson Road between Granite Canyon Trailhead and the Death Canyon Road junction is scheduled to close for the season the evening of October 31. Starting Monday, October 16, a temporary closure will be in effect for several trails and walkways within the Jenny Lake area of Grand Teton National Park. 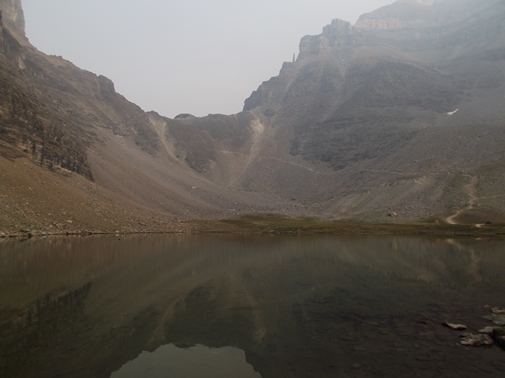 The temporary public closure is necessary to ensure public safety during helicopter transport of heavy material to the Hidden Falls and Inspiration Point areas on the west side of Jenny Lake, as well as the paved walking paths on the east shore of the lake. The public closure is scheduled to be in effect through Sunday, October 22, though it may be lifted sooner as work is completed or postponed due to weather conditions or other circumstances. Trails leading from Jenny Lake’s southeast shore to Hidden Falls and Inspiration Point will be temporarily closed to all public access. Walking paths around the Jenny Lake Visitor Center will also be closed intermittently. Lake access from the public boat launch will not be allowed. All visitor services in the Jenny Lake area, including the shuttle boat and visitor center, are closed for the season. Signs will be posted throughout the closure area, and park staff will be positioned to provide suggestions for alternate routes for anyone visiting this area of the park. Areas not affected by this temporary public closure include: the Teton Park Road; Jenny Lake scenic loop road; access to Jenny Lake via the String Lake trailhead; access to Cascade Canyon via the horse trail bypass; and access to the Lupine Meadows trailhead. 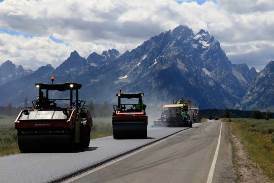 This construction work is part of the Jenny Lake Renewal Project, a $19 million public-private partnership between the National Park Service and Grand Teton National Park Foundation. The project will enhance the visitor experience at the park’s most popular destination for generations to come. 2017 is the fourth of five major construction seasons. Before venturing into grizzly bear country it's always a good idea to educate yourself on how to prevent an encounter, and what to do should you see a grizzly while on the trail. Before venturing into the Canadian Rockies this past September (see blog posts from the past two weeks), we stopped in Glacier National Park for a few days of hiking. Other than Yellowstone, it may have been the highest concentration of wildlife we've ever seen in only a few days. In addition to the amazing scenery atop Grinnell Glacier Overlook, the highlight of our trip was the white wolf we saw in the Medicine Grizzly valley. It was the first wolf any of us had ever seen in Glacier. 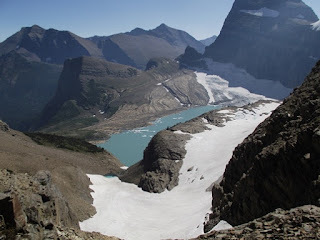 * Grinnell Glacier Overlook is quite possibly the best view in Glacier National Park! This is in addition to all the stunning scenery you'll see along the Highline Trail before reaching the overlook. As we sat there soaking in the magnificent views, a nanny mountain goat and her kid raced past us - within 10 feet! At first we thought we were being charged, but she just wanted to get to the other side safely. 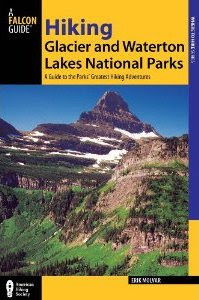 * Lake Josephine Loop - This loop takes you around both Lake Josephine and Swiftcurrent Lake in the Many Glacier area. The hike is mostly flat, making it a great choice for almost everyone in the family. Oh yea, the views are simply outstanding! Almost every time we've hiked in this area we've seen at least one moose. * Triple Divide Pass - If you're looking for a little bit of solitude in Glacier National Park, Triple Divide Pass just may be the ticket. The trailhead is located in Cut Bank, roughly half-way between Two Medicine and St. Mary. 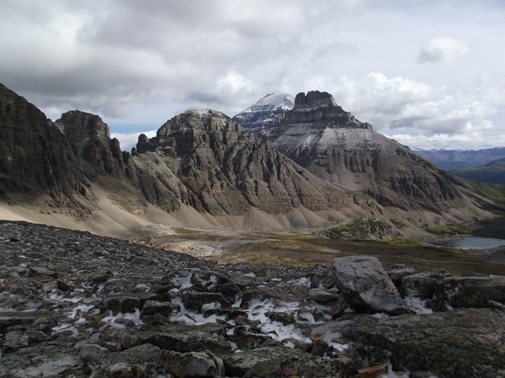 The pass lies just below Triple Divide Peak, the only hydrological apex in North America - or is it? After soaking in the panoramic views from the pass, while proceeding down the mountain, we saw a white wolf trotting through a meadow in the valley below. 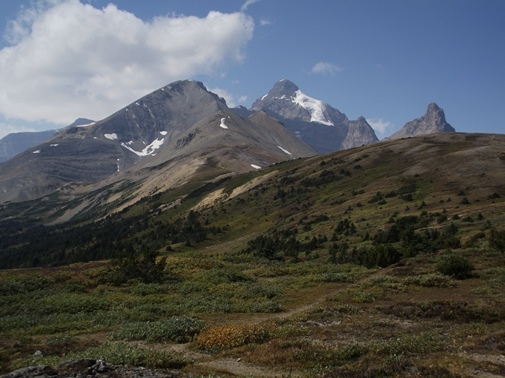 * Two Medicine Pass - Our wildlife tour definitely continued on this hike. 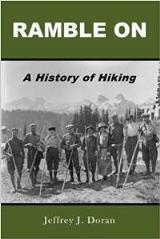 During this trek we saw an owl as it soared through the trees just up the trail, saw an extremely large bull moose just below Rockwell Falls, and then, as we neared the pass, we came upon a large herd of Bighorn sheep. Numbering at least three dozen, it was by far the largest herd of Bighorns we've ever seen in one place. 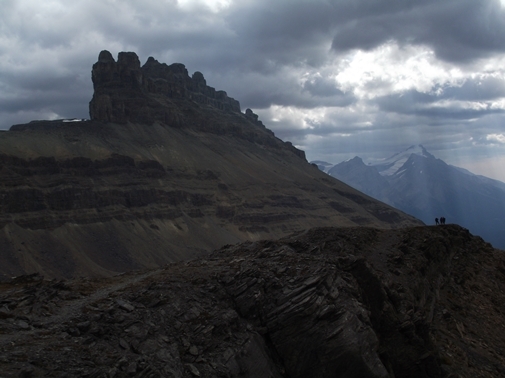 Once atop the pass we enjoyed outstanding panoramic views on both sides of the narrow ridge. To see all of the trails covered by our website, please click here. 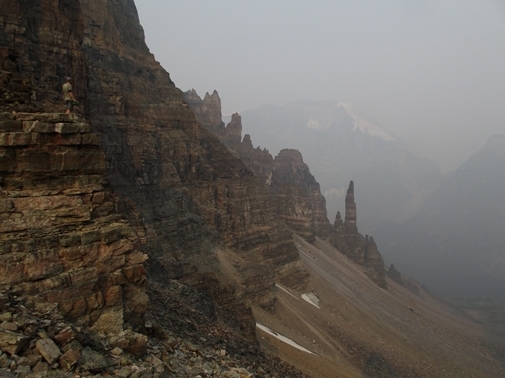 The hike to Sentinel Pass begins from Moraine Lake, which sits at the foot of the Valley of the Ten Peaks. Both the lake and the valley were featured on the reverse side of the Canadian twenty dollar bill between 1969 and 1979. At the foot of the lake is a large pile of boulders and rocks, leftovers from the glaciers that retreated thousands of years ago. A climb to the top of the rock pile is a popular destination for photographers. The view there of the lake and the valley is considered to be one of the most photographed scenes in Canada, and is now known as the "Twenty Dollar View". 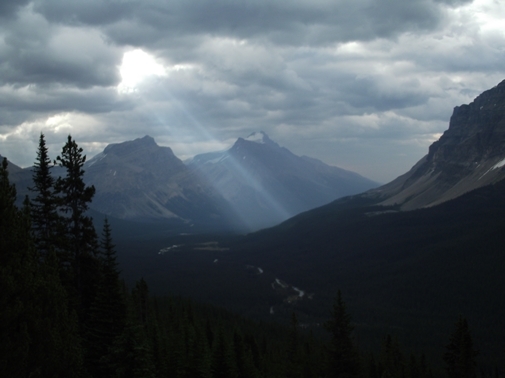 To say the least, this is an exceedingly beautiful scene, perhaps the most stunning in all of the Canadian Rockies. 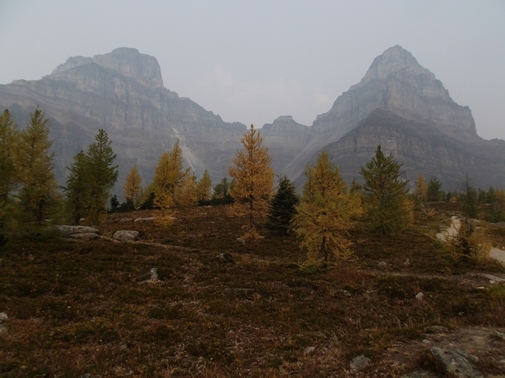 After a relatively steep climb the trail levels off and begins traveling through the scenic Larch Valley. 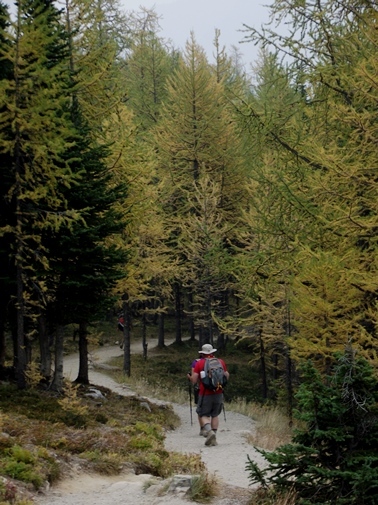 This is a great option during the fall if you wish to see the needles of the larch trees turn golden yellow. 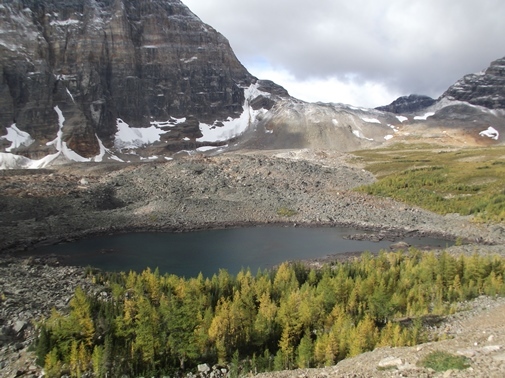 Larches are one of only a few species of conifers that shed their needles in the fall. 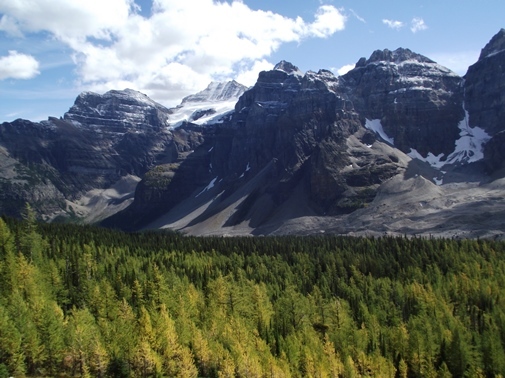 As you proceed towards the pass you’ll enjoy great views of the Valley of the Ten Peaks. Just before reaching the pass the trail passes a small tarn. From here you'll be able to see your destination, as well as the path that leads to it. 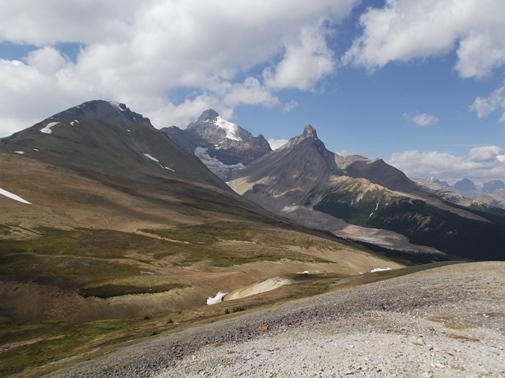 Once atop the pass you’ll enjoy outstanding panoramic views of both the Larch Valley and the Paradise Valley. 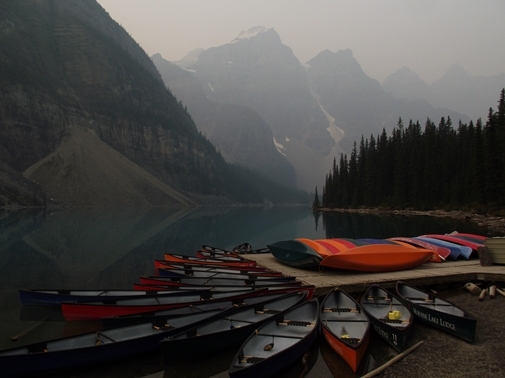 Unfortunately heavy smoke from the wildfires spoiled our views. 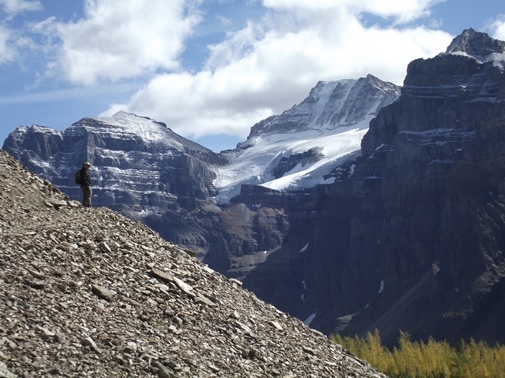 This outstanding hike, which begins from the Icefields Parkway just south of the Icefield Center, ascends Parkers Ridge where you’ll enjoy dramatic views of the Saskatchewan Glacier. 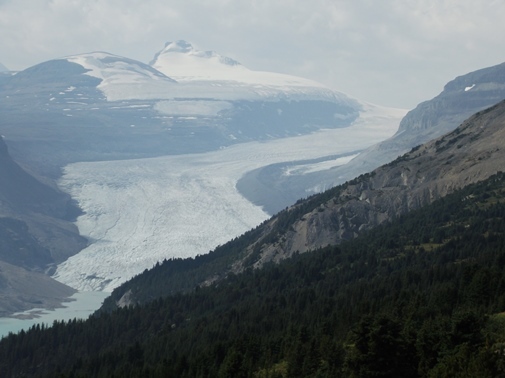 The glacier forms the headwaters of the North Saskatchewan River. Once at the top you’ll have the option of continuing your hike by heading either north or south along the broad ridge. We proceeded in both directions, both of which offered awesome views. Although the official roundtrip distance is listed at 2.5 miles, the actual mileage was more than that. We ended up doing roughly 4.25 miles total, which included our two relatively short side trips. 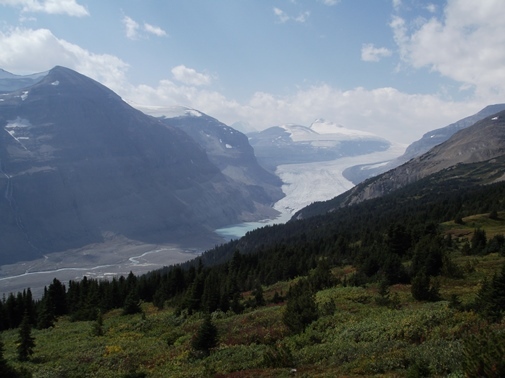 The Saskatchewan Glacier is the largest outflow glacier originating from the Columbia Icefield. Resting along the Continental Divide, the glacier is approximately 8.1 miles (13km) long, and covers an area of 11.5 square miles (30km²). In 1960 it was measured at more than 1300 feet (400m) thick at a distance of 5 miles (8km) from its terminal snout. 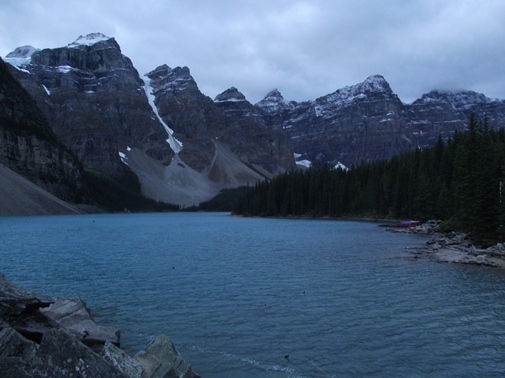 The hike to Wenkchemna Pass begins from Moraine Lake, which sits at the foot of the Valley of the Ten Peaks. Both the lake and the valley were featured on the reverse side of the Canadian twenty dollar bill between 1969 and 1979. At the foot of the lake is a large pile of boulders and rocks, leftovers from the glaciers that retreated thousands of years ago. A climb to the top of the rock pile is a popular destination for photographers. 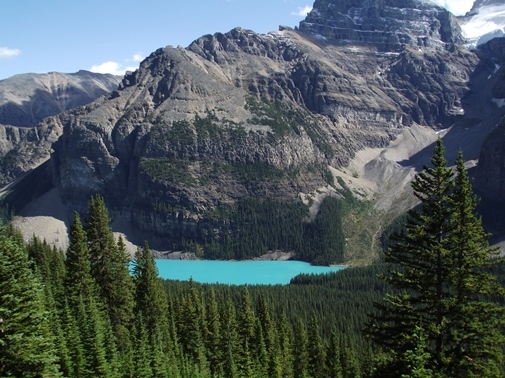 The view there of the lake and the valley is considered to be one of the most photographed scenes in Canada, and is now known as the "Twenty Dollar View". 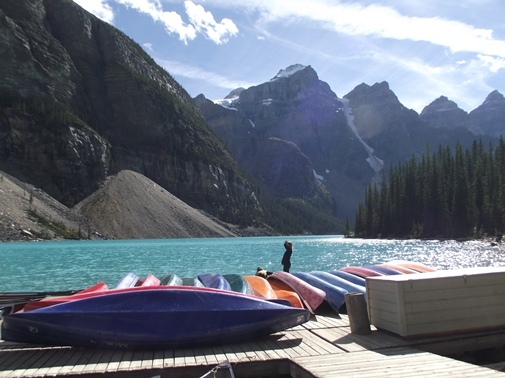 To say the least, this is an exceedingly beautiful scene, perhaps the most stunning in all of the Canadian Rockies. 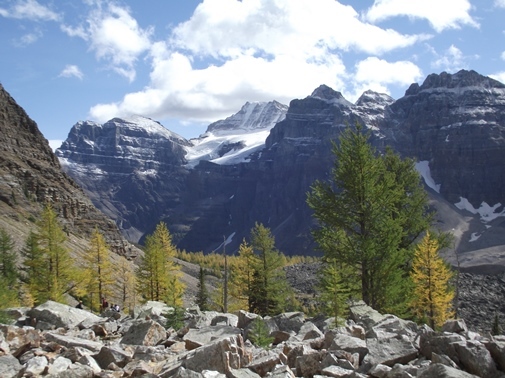 This hike proceeds all the way to the end of the spectacular Valley of the Ten Peaks. Near the head of the valley is Eiffel Lake. Beyond the lake the trail climbs to the pass. The highest peak in the range is the 8th peak in the valley. 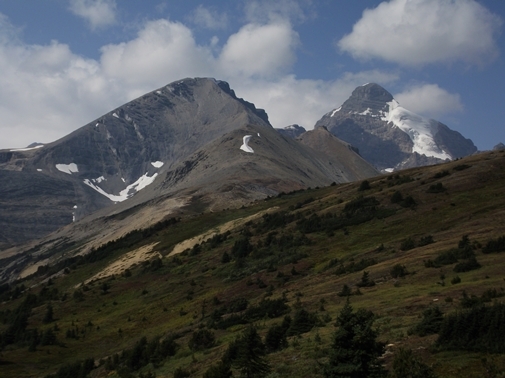 Known as Deltaform Mountain, this rugged peak tops out at 11,234 feet (3424m). 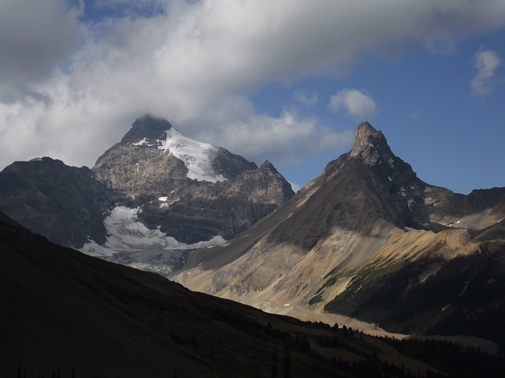 The last mountain in the chain, Wenkchemna Peak, means “ten” in the Stoney Indian language. Fortunately for us a cold front passed through the mountains the night before our hike, and pushed the thick smoke out of the area. That morning we awoke to a cold and blustery early-September day. We even saw a few snowflakes – the first of the season for us. As the day wore on the clouds rolled out and we enjoyed beautiful blue skies. 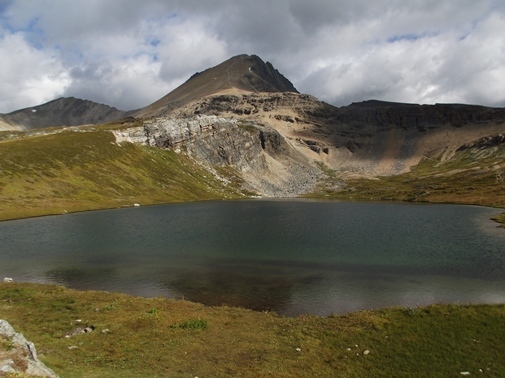 This outstanding hike leads to a spectacular alpine meadow filled with wildflowers after the snowmelt, before visiting two lakes and a mountain pass that offers stunning panoramic views. 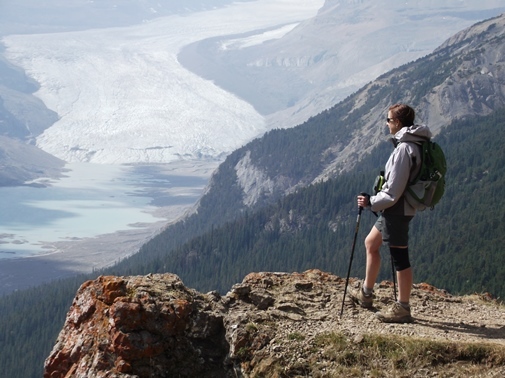 The hike begins with a climb up the south-facing slopes of the Bow Valley, which eventually offers views of Crowfoot Glacier across the valley. 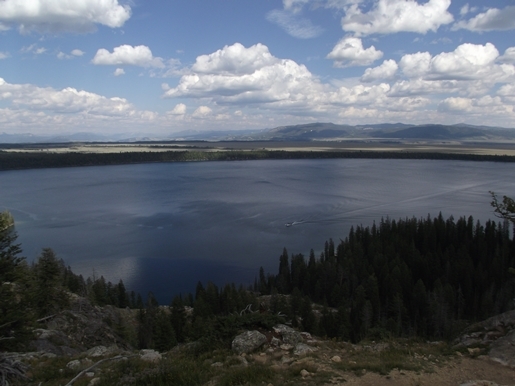 After 3.5 miles hikers will reach their first destination on this hike, Helen Lake. 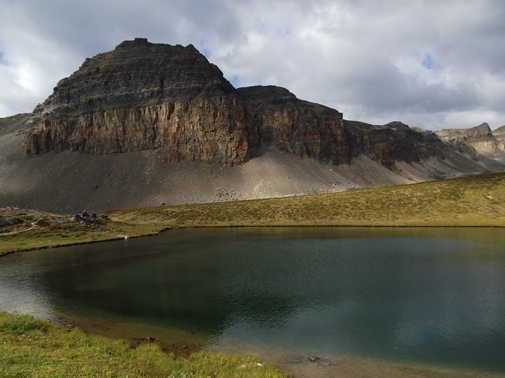 The cirque mountain walls that frame Helen Lake are home to a large community of marmots. Though we didn’t actually see any, we heard their distinctive whistles echoing off the walls of the natural amphitheater. We also saw a golden eagle soaring along the updrafts. It appeared to be nesting high along the mountain opposite the lake. 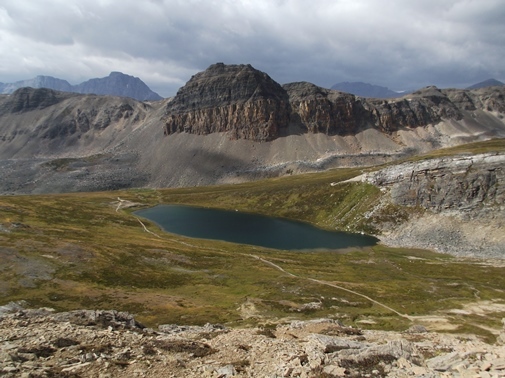 After soaking in the views we climbed above Helen Lake with the intention of proceeding towards Dolomite Pass. Somehow, after reaching the ridgetop above the lake, we took the wrong trail, an unmarked social trail that led us along the canyon ridge. Though it didn’t take us where we intended to go, it did offer outstanding views of both Helen and Katherine Lakes, as well as the mountains that surrounded them. With threatening skies moving in once again, we decided to end our hike there. Teton Interagency Fire personnel will be burning piles of slash created from fuels reduction and hazard tree projects within Grand Teton National Park and Bridger-Teton National Forest. Firefighters will burn these piles under low fire behavior conditions as colder temperatures and wet conditions exist. ◦ Southeast of Phelps Lake. Additional fuels reduction work will take place this fall north of the Pacific Creek Subdivision access road. Within the Blackrock and Jackson Ranger Districts of the Bridger Teton National Forest, slash piles will be burned in the permitted areas of Jackson Hole Mountain and Snow King Mountain Ski Resorts, and the forested areas of Sheffield Campground and neighboring Jack Pine summer homes in the Granite Creek area. Additional areas on the forest with piles may also be targeted for burning this fall. Most of these projects are designed to reduce vegetation and lower the risk of losing structures to a wildfire and create more open areas that will help moderate fire behavior during a wildfire. Some debris piles are from routine hazard tree removal, and trail and road maintenance activities. Slash piles are created by thinning and removing lower limbs from trees, and removing hazard trees, as well as removing dead wood and brush from the forest floor. Firefighters place the slash in tepee-shaped piles and leave them to cure before burning. Creating this defensible space is essential to public safety and improving a neighborhood’s chance of surviving a wildfire. Fuels reduction work also increases firefighter safety in the event of a wildfire. Smoke will be visible in the vicinity of burning slash piles. Ignitions will cease early in the afternoon each day to allow piles and fuels to burn down prior to evening inversions and reduce smoke impacts to the area. All piles will be monitored until they are declared out. The thinning and removal of vegetation on private property, when accompanied with adjacent fuels reduction projects on public lands, helps create the necessary space to slow or stop the spread of wildfire and also protects homes from catching fire, either from direct flame contact or radiant heat. Home and property assessments are available through the Teton Area Wildfire Protection Coalition partners at no cost. To learn more about fire prevention and fire-adapted communities call 307-739-5424 or visit Tetonfires.com.